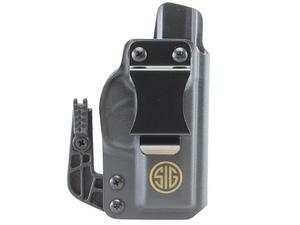 In collaboration with Black Point Tactical, SIG SAUER is offering a high-quality IWB carry holster option for shooters. This IWB style holster is designed to ideally conceal your P365. The holster ships with an installed SIG Strut that creates leverage against your body drawing the firearm closer, creating less printing while carrying. The SIG Strut favors appendix carry but can easily be removed, and replaced, with (2) supplied spacers for IWB carry in all other positions. Available in right hand draw configuration.